The Lifesaving SA junior team secured the first gold medal for the country at the Lifesaving World Championships being held in Adelaide, Australia. The team topped the podium after winning the junior mixed Simulated Emergency Rescue Competition on the first day of the competition. The team includes four members, Kira Bester, Tamryn McKie, Alice Edward and Milan Erasmus, who expressed their joy after their performance. ‘We feel very proud as a team, we are glad that we have set the standard, shown other competitors what we are made of, a force to be reckoned with, and we are planning to win this competition,’ Erasmus said. ‘We’re really happy that our team got the gold, we really worked well together and we are looking forward to the rest of the competition,’ added Bester, McKie and Edward. Meanwhile, the Team SA’s seniors finished fourth overall in their mixed SERC event, coming behind the defending champions New Zealand, who took third place. Day two also offered its joys as Team SA managed to secure good scores in both individual and team competitions. In the beach competition, Paige Horn made the A final, finishing seventh overall, the male relay team finished eighth, while the female team finished in sixth position. While in the beach flags competition, Daniel Jacobs finished joint 20th, and McKie and Horn also finished in joint 20th. In the open pool events, Johan Lourens finished seventh in the 200m obstacle, Kristen Bellinghan 13th and Carmel Billson 14th. In the 4 x 50m obstacle relay, the men’s team finished 11th overall, while the women’s team finished in 12th position. The men’s team of Martin Binnedell and Johan Lourens missed out on a podium finish in the line throw, coming in at fourth, and Binnedell finished in 5th in the 100m rescue medley. To wrap up the day in style, the team celebrated the bronze medal win by Nic Horn, who came in third in the beach flags competition. With more competition days ahead, Team SA is looking forward to bag more medals. 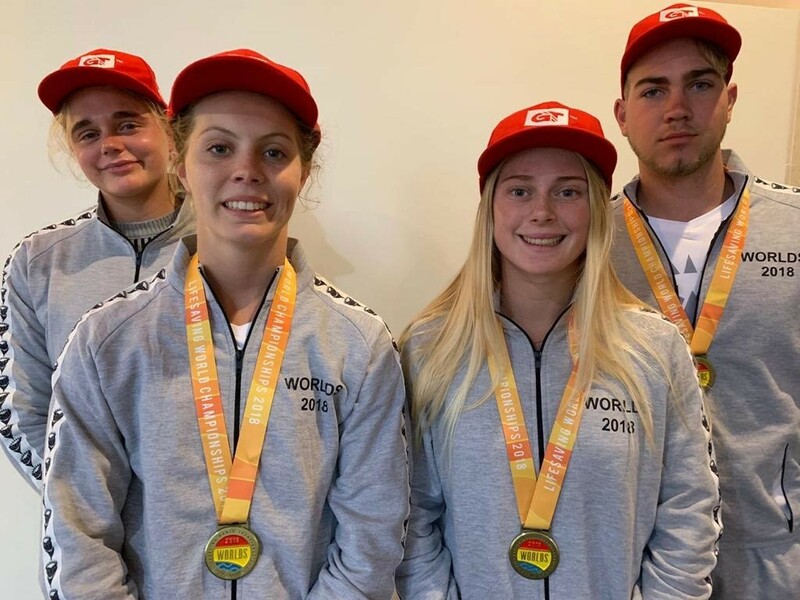 Photo: From left to right: Kira Bester, Alice Edward, Tamryn McKie and Milan Erasmus, wearing their gold medals after winning the junior mixed Simulated Emergency Rescue Competition, supplied.